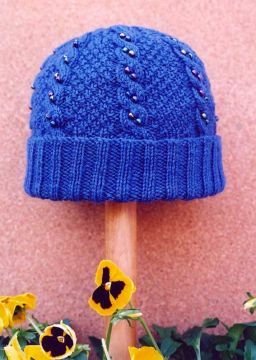 This is a great project to try out knitting with beads for embellishment and complements The Beaded Cable Mittens. Instructions for threading the beads and placing them on the cables are included. The pattern and beads may be ordered below. This project takes one skein of medium weight yarn. We recommend using Blackberry Ridge's medium weight 25% Mohair/75% Wool yarn. A $3.00 shipping option can be selected for patterns during checkout. The $3.00 shipping option for patterns during checkout can also be used for beads.